» Incrementum Insights: How Will Cryptocurrencies Change Finance? We want to sincerely thank Stefan Kremeth for contributing to this chapter. Stefan Kremeth is the CEO of Incrementum AG in Liechtenstein. Prior to joining Incrementum, Stefan worked for UBS, Sal. Oppenheim, and Lombard Odier. Mr. Kremeth is also the writer of Stefan’s Weekly, a weekly newsletter that covers practical questions concerning equities, commodities, and pension systems, amongst other financial topics. In this chapter, the CEO of Incrementum Stefan M. Kremeth shares his experience with cryptocurrencies and the blockchain technology. Coming from a financial background, Kremeth finds the crypto space to be faster and more inclusive. In this interview, we discuss some of the misconceptions about cryptocurrencies and what role he sees for his firm in this space. Can you tell us a little bit about Incrementum and about yourself? I cofounded Incrementum AG, a wealth management firm, in 2013. Today, the partners of the company expanded to encompass Ronald Stöferle, Mark Valek, and Dr. Christian Schärer. My career in finance began when I was a young man. After completing an apprenticeship at UBS, I worked for UBS in various countries. After some time, I switched employers and eventually held executive positions in two private banks. Parallel to this, I attended the Swiss Banking School and I acquired an executive MBA in international asset management from the University of Liechtenstein. After which I continued my studies at Durham University in England. I am currently a part-time doctoral student in the business school at Durham. How is the crypto space different from the traditional finance space? It is very different. First of all, everything is quicker and faster. Costs have been minimized. A broader part of the population can access financial services in the crypto space compared to traditional banking. People who normally would not have access to capital or banking facilities can have access to financial services via Internet. In my opinion, this “inclusive” aspect of the blockchain technology is revolutionary. Capital market transactions can become easier, quicker, cheaper, and available on a global scale thanks to the blockchain technology. Do you see any common misconceptions about cryptocurrencies and blockchains? Yes, actually. There is the misconception that intangible assets do not have value. However, this is not true: some cryptocurrencies are backed by tangible assets, some provide access to potential earnings, and some provide access to a network. We can look at this argument the other way around as well. If I am wrong, and it is the case that intangible assets have no value, then this would apply to a lot of other asset classes as well. For example, fiat currencies are mostly intangible. Although fiat currencies are backed by a government that can tax income, that does not make fiat currencies tangible in my opinion. However, I think we are the very beginning of the blockchain revolution. At Incrementum, we believe that a lot of the cryptocurrencies that we see today are going to disappear in the short to mid-term. There is potential for some to stay, and for some to stay for a long time. If cryptocurrencies stay around, I am convinced that regulators will regulate cryptocurrencies like every other investment, which they should do in order to level the playing field for all financial assets. The technology will stay. If a young person has a fantastic idea but is sitting somewhere in Bangladesh with limited access to financial markets, the blockchain technology enables him or her to tap into the global capital market. With an Internet connection, he or she can find people who are willing to fund their idea in exchange for virtual tokens. The blockchain helps people make businesses, and I find this fantastic. I am not a conspiracy theorist, but historic events, regulations, and high capital requirements restrict market access to newcomers. The blockchain technology can reduce the barriers to capital and financial services, such as lending, borrowing, and saving. Do you see a role for Incrementum in the crypto space? Incrementum has the Crypto Research Report, but do you have any other products in the pipeline? Yes, since we see a future for the blockchain technologies and cryptocurrencies, we are working on crypto-related products. As you mentioned, we produce a quarterly research report on cryptocurrencies called the Crypto Research Report. We decided to do a Crypto Research Report because we wanted to build-up our own base of knowledge on the topic. Second of all, we want to inform a broader audience about what is actually happening in this space. The report is unbiased and informative. We never give investment advice. 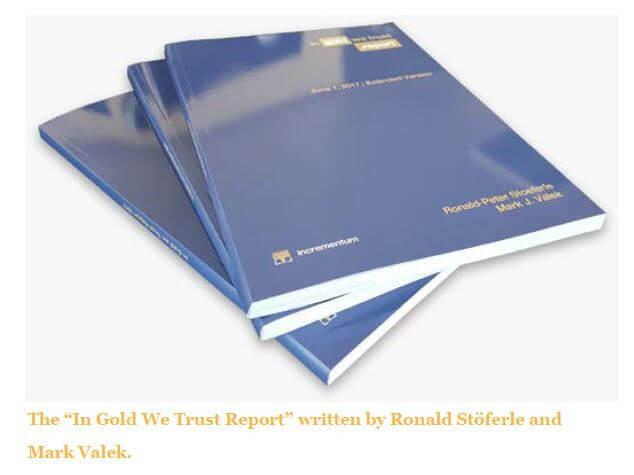 Our other report, In Gold We Trust, has become an industry standard for gold market participants. Like In Gold We Trust, we hope that the Crypto Research Report becomes a go-to guide for financial market participants interested in the blockchain technology. Also, we have seen demand in the market for a crypto fund. Not everyone wants to open wallets at exchanges that have limited history or no history. A lot of people want to have consolidated reports on their assets for tax and regulatory reasons. We believe that a regulated product that stores a diversified portfolio of cryptocurrencies will be interesting for investors. Of course these investors must know that cryptocurrencies are very volatile. However, a company that is regulated by financial market authorities, has transparent accounting, and a good reputation can help investors enter this market with the appropriate risk management. Together with a custodian bank and a fund administrator, we have filed a proposal at the Liechtenstein Financial Market Authorities for a license for a multi-currency crypto currency fund and have received approval some days ago! You mentioned that the Crypto Research Report does not give investment advice. Why is that? There are various reasons. First, a neutral and informative report can be used by a much wider audience, which will increase our brand exposure worldwide. We want to signal that Incrementum is ahead of the curve by informing readers about the market. If our report is well done, it has the potential to become the standard for crypto research in the entire industry. Second, there is a regulatory reason. We do not want to find ourselves in a situation where our readers take investment decisions solely based on our report. As a wealth-management firm, our readers could come after us if they lose money because of our advice. Incrementum is working with academics at the University of Liechtenstein to bolster the Crypto Research Report’s scientific rigor and relevance; however, we make the academic research easy for everyone to understand. If the report is free, how does the report contribute to Incrementum’s bottom line? Thanks to the neutrality of the report, we are able to find sponsors such as Bank Vontobel, who benefit from cryptocurrency research and increased brand recognition in the cryptocurrency space. We like to have sponsors from various business fields, and our sponsors can advertise services such as fund custodianship, cryptocurrency exchanges, and cryptocurrency trackers. We are looking for more sponsors, and we encourage prospective firms to contact us if they are interested.